Football Jumpers .com » Blog Archive » Dodgy surface at Etihad Stadium ? Dodgy surface at Etihad Stadium ? Shaun Higgins , a rising Bulldog star , rolled his ankle on Etihad stadium's surface on Sunday afternoon . AFL team the Western Bulldogs , one of five tenants of the ground will lodge their third complaint with the Stadium management. They believe Higgins was injured because of the soft surface of the Ground . The AFL Players' Association is investigating the circumstances of Higgins' injury. A Collingwood player from Sunday,s Game , Dale Thomas ,described the surface as tacky and shifting in spots. The Bulldogs will send an official written complaint for the AFL. Ultimately, the Dogs are seeking action as well as an explanation. 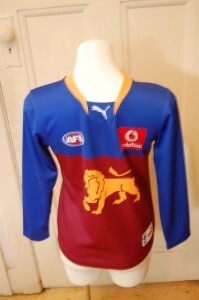 Fans want to wear their jumper , jersey , guernsey to the Game and see their team and its stars play well. What action will be taken ? Will Lions fall at Etihad ? This entry was posted on Wednesday, June 9th, 2010 at 9:18 am	and is filed under AFL, football jumpers, NRL. You can follow any responses to this entry through the RSS 2.0 feed. Both comments and pings are currently closed.